Garún has an aura of intense richness and a haunting aroma with heady notes of chocolate, licorice and coffee. The soft Icelandic water plays a crucial role in giving this exceptional damsel its smoothness, and the double fermentation infuses the beer with a taste that is at once pungent and mild. The first lady of Borg is named after the heroine of one of Iceland’s most popular folktales The Deacon of Dark River. 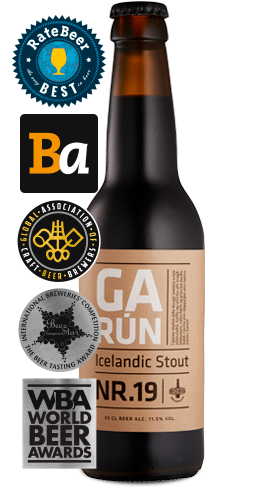 A tale of ghosts, unrequited love, and life triumphing over death, told against the backdrop of elements essential to Iceland’s character: ice, snow and whorling waters; dark and mysterious – the same elements that inspire this rich and bold Icelandic stout.